Biomedics 1 Day Extra Toric lenses are exactly the same as Biomedics 1 Day Toric, only the packaging and name has been updated. If you have a valid prescription for Biomedics 1 Day Toric then you can order Biomedics 1 Day Extra Toric. BioMedics® 1 Day Extra Toric - The BioMedics® 1 Day ExtraToric for astigmatics is designed for comfort and stable constant vision. Now astigmatics can enjoy using hassle free daily toric lenses. No cleaning, no solutions and a new set of lenses every day. The advanced horizontal iso-thickness design with junctionless front surface will allow the eyelid to encounter a smooth surface on every blink, maximising comfort. 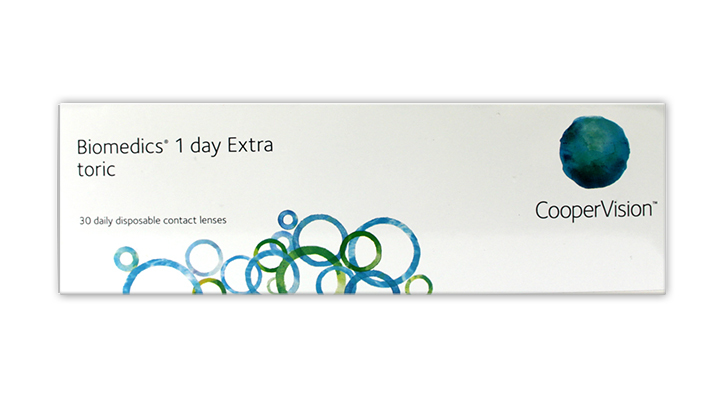 Each box contains 30 daily contact lenses in individual packed buffered saline solution. Be the first to write an online review of Biomedics 1 Day Extra Toric and share your thoughts on this product with other shoppers!